Return one level in the navigation. Greg Garland is chairman and CEO of Phillips 66, a diversified energy manufacturing and logistics company. A chemical engineer, Garland has more than 30 years of industry experience in technical and executive leadership positions within the oil and natural gas and chemicals industries. Previously, Garland had served as senior vice president, Exploration and Production, Americas, for ConocoPhillips since 2010. 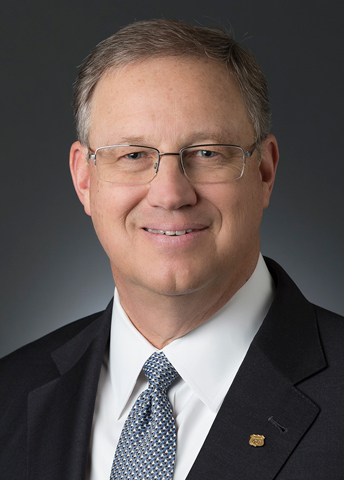 Prior to joining ConocoPhillips, Garland was president and chief executive officer of Chevron Phillips Chemical Company, which is now a joint venture between Phillips 66 and Chevron. Before his election to that position, Garland served Chevron Phillips as senior vice president, Planning & Specialty Chemicals. His prior experience includes serving as general manager of Qatar/Middle East for Phillips, a position he assumed in 1997. From 1995 to 1997, he served as general manager of natural gas liquids after serving as manager of planning and development in planning and technology. From 1992 to 1994, he was manager of the K-Resin® business unit. Garland began his career with Phillips in 1980 as a project engineer for the Plastics Technical Center. He later worked as a sales engineer for Phillips' plastics resins, business service manager for advanced materials, business development director, and olefins manager for chemicals. He is the chairman and CEO of Phillips 66 Partners. He serves on the board of directors for Phillips 66 Partners, DCP Midstream, Amgen, the Barbara Bush Houston Literacy Foundation, The Greater Houston Partnership, the National Petroleum Council, the board and executive committee of the American Petroleum Institute, as a member of the engineering advisory board for Texas A&M University and as chairman of Junior Achievement for Southeast Texas. Garland received a Bachelor of Science degree in chemical engineering from Texas A&M University in 1980. FacebookLink opens in a new window. TwitterLink opens in a new window. InstagramLink opens in a new window. YoutubeLink opens in a new window.